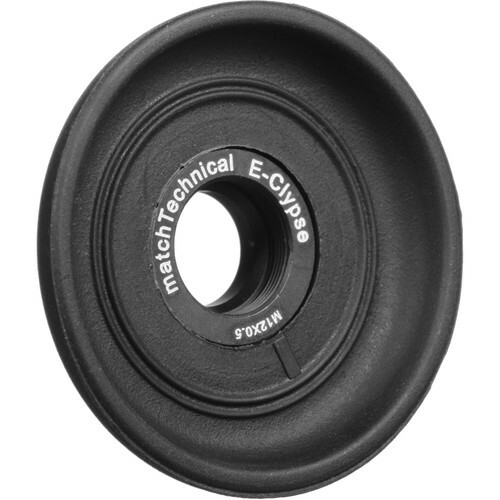 Keep unwanted light out of your eye when looking through your Leica's viewfinder with this 42mm E-Clypse EyeCup from Match Technical. Blocking such stray light allows for greater overall visibility, and also enables you to see more contrast in the scene as you're trying to compose shots. Designed specifically for Leica M cameras with M12 x 0.5 threads, including all models from the M3 to the M240 series, the E-Clypse can be mounted easily to the viewfinder, just like Leica's own magnifiers and diopters. The circular eyepiece works equally well when the camera is held in portrait and landscape orientations. While its core is made from an extremely durable, black anodized 6061 aluminum alloy, the rest of the accessory is crafted from soft silicone rubber to afford optimal comfort and ensure that eyeglass lenses are not scratched or damaged. This material is sufficiently flexible while also being tough and resistant to permanent deformation. Additionally, the E-Clypse's compact size and low profile prevent it from becoming accidentally detached, allowing you to keep it on the camera permanently and stow it easily in your bag. As the viewfinder on the Leica M models provide little surface area, Match Technical has created a pinching area on the eyepiece to enable it to lock securely onto your camera. Box Dimensions (LxWxH) 2.7 x 2.6 x 2.2"